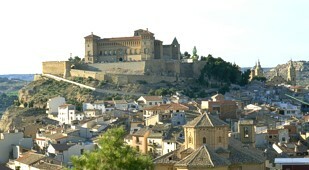 Alcaniz is one of the main cities of Aragon, a region in the northeast of Spain. With some of the most stunning examples of Renaissance and Gothic architecture, the most dominating feature is the 12th century Castle of Los Calatravos which stands on the hill top of Cumbre de Cerro Pui-Pinos overlooking Alcaniz. Built in the 12th century, it was the town’s main defence and housed the convent of the Order of Calatrava. Part of the castle was converted into a palace during the 18th century. This same section of the Castle has since been converted into a Parador, Hotel La Concordia. Decorated with a baroque facade and gothic walls, it has wonderful views over the town and the river below. Inside the Parador is a plaque that dates back to 1410 dedicated to Martin the Humane who was King at the time. As he died without an heir there was great debate as to who would inherit the throne and it was two years before a decision was finally made. As it turned out the next King of Aragon, Fernando 1, was very much a wise choice as his descendants went on to become famous names in Iberian history. In the main square, the Plaza Major, you will find a beautiful collection of medieval buildings which includes the City Hall and the Exchange. The Excolegiata of Santa Maria Maggiore is a preserved medieval bell tower which was rebuilt in 1736 with three naves as well as side chapels. Another interesting place to visit is the Torre del Homenaje. The tower walls are decorated with wonderful frescos and slightly more controversial are the murals of profanity on the floor above. The gothic gateway to the city has an interesting story behind it. Nicknamed ‘the door of the traitor Judge’, this was the entrance where Pedro 1 el Cruel entered with his troops to conquer Alcaniz. With a reputation for annihilating everything in his path, the story goes that a Judge made a pact with his invaders by agreeing to open the gate on the assurance he would not be tortured. Consequently the town was taken without any reprisals, however the Judge later fled with the conquering troops. During Easter week celebration drums are played throughout the villages of Aragon beginning on Good Friday with a procession of a thousand drummers walking through the town. In the evening the drums beat a different sound which is more of sadness and devotion and continue right through the night. On Easter Saturday there is another procession with everyone in historical and religious costumes carrying blessed cakes. The drumming finally finishes with the ceremony of the closing of the Tomb. It is definitely one of the most heartfelt festivals in Spain. If you adventure beyond Alcaniz one place you must try to see are the Cave paintings of Val del Charco. Declared a World Heritage Site it is one of the largest collection of cave art in Europe. With Barcelona only a few hours away you can enjoy yet another one of Spain’s most popular cities whilst staying in the enchanting Castle of Alcaniz.